A prominent Hong Kong student group is furious that British ministers have kowtowed to the Chinese communist regime on the issue of democratic reform in the city. 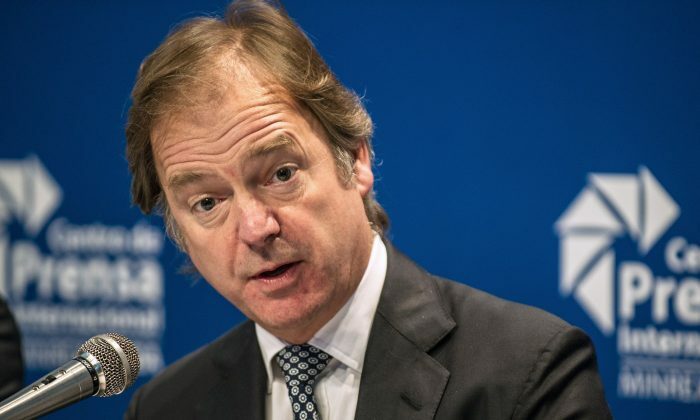 In a low-key meeting with Hong Kong lawmakers on Thursday, Jan. 15, Stephen Lillie, Foreign Office Asia-Pacific director, and Foreign Minister Hugo Swire quietly backed a controversial Beijing ruling for the 2017 Hong Kong leader elections. The Standing Committee of the National People’s Congress—the Chinese regime’s faux legislature—allowed Hongkongers to elect the city’s Chief Executive by universal suffrage, but only from two or three screened candidates nominated by a 1,200-member pro-Beijing committee. The NPCSC will also have the final word on the election results. Despite the NPCSC’s strict restrictions, Lillie still believes that a “genuine choice” of Chief Executive candidates “who do not all look exactly the same with the same range of policies and the same political affiliation, from the pan-democrats to pro-Beijing parties,” would emerge, according to the South China Morning Post. Swire added that Hong Kong lawmakers should consider the proposal even though it may not be “perfect” or “pure” because “something is better than nothing,” perhaps aware that pan-democrat legislators are planning to reject democratic reform on the NPCSC’s terms. If pan-democrat lawmakers proceed with their “all or nothing” plan, the reform bill won’t get the required two-thirds majority to be passed, and the Hong Kong government will be forced to restart a cumbersome five-step process for constitutional development in the semiautomonous city. Alan Leong, leader of the pro-democracy Civic Party, called Swire’s stance “improper,” and reminded Britain of its “moral obligation” to back the Hong Kong people to attain genuine universal suffrage, Ming Pao reports. Likewise, the Hong Kong Federation of Students (HKFS) held the United Kingdom to its commitment as a signatory of a historic international treaty. HKFS concluded by calling on the British government to retract its “opinions on supporting the fake universal suffrage proposal by Beijing” and enforce the Joint Declaration. The British foreign officials’ decision to suddenly back the NPCSC’s decision is a curious one. Chris Patten, the last governor of Hong Kong, and other ministers have declared that Britain is “honor bound” to speak up for Hong Kong if Beijing doesn’t keep to the promises laid out in the 1984 Joint-Declaration. Yet voicing displeasure and fury is the only thing that Britain is doing now instead of taking Beijing to task for a number of contentious actions. For instance, British members of parliament who were banned from entering Hong Kong to verify if Beijing had kept its end of the Joint-Declaration called an emergency parliament session where they complained bitterly—Sir Richard Ottaway, the chair of a Foreign Affairs Committee, denounced the Chinese regime’s actions as a “manifestly irresponsible and incorrect position to take”—but failed to convince British authorities to seek redress from Beijing. Indeed, UK’s top leader David Cameron has not properly responded to the Chinese regime’s ban or the claim that Britain doesn’t have anymore “moral responsibility” to “interfere” in Hong Kong because the Joint-Declaration has been “fulfilled” and is now “void” after the 1997 handover. Also, despite the urgings of the Foreign Affairs Committee, Ni Jian, the Chinese diplomat who made those claims about the Joint-Declaration, has not been formally asked to explain his provocative statements. This suggests that Britain is more interesting in not angering China over honoring its treaty obligations to Hong Kong. A close parsing of the British Foreign Minister’s words hints at Britain’s desire for cooperation with China over confrontation. During an emergency session of parliament called to discuss the British MP ban, Swire said that the committee tasked to inquiry into Hong Kong affairs is independent from the British government, and doesn’t count as the UK nosing in Chinese affairs. And ahead of Chinese leader Xi Jinping’s possible state visit to Britain this year, Swire is now telling Hong Kong lawmakers to accept the NPCSC’s decision, which potentially breaches the Joint-Declaration, instead of asking Beijing to explain their controversial remarks about an international treaty that is still valid for more than thirty years. According to Ming Pao, pro-establishment Hong Kong lawmakers who attended Swire and Lillie’s meeting have a good idea why the Foreign Minister is backing Beijing: more economic gains.